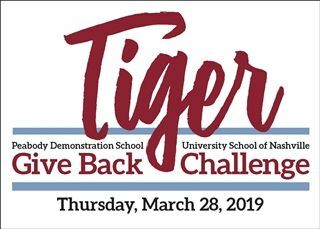 Remember to wear your garnet and Columbia blue Thursday, March 28 during the Tiger Give Back, a 24-hour challenge to support the Annual Fund. Help USN ahead of the challenge by posting "I am proud to be a Tiger because..." and using #TigerGiveBack on social media. PDS/USN Tigers across the country will come together for 24 hours during a fun and fulfilling challenge designed to build community spirit and support students, faculty, and staff. The Tiger Give Back Challenge is 8 a.m. Thursday, March 28 through 8 a.m. Friday, March 29. 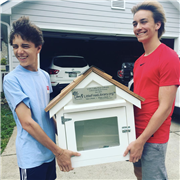 This fundraising event was previously known as the 36 Hour Give Back Challenge and last year raised $92,000 from 482 donors to support the school's Annual Fund. The Annual Fund accounts for roughly 6 percent of USN’s operating budget. It supports need-based financial aid, campus and environmental stewardship, visual and performing arts, athletics and lifelong wellness, faculty development, academic programming, and the school’s highest priorities for the year. 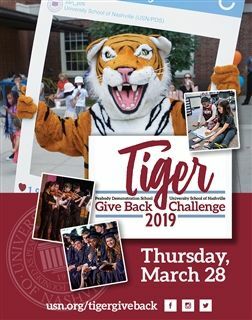 The 2019 Tiger Give Back Challenge is led by Co-Chairs Mollie Shmerling Perry '03 and Bobby Perry '03 as well as committee members Scott Collins '05, Ivanetta Davis Samuels '86, Scott Ghertner '85, and Shannon Paty '68. They will kick off the challenge with a party from 5 to 7 p.m. Wednesday, March 27 at Fat Bottom Brewery, 800 44th Ave. N. All Nashville-area alumni, parents, and friends of USN are welcome to attend. RSVP here. Help USN ahead of the challenge by posting "I am proud to be a Tiger because..." and using #TigerGiveBack on social media. Or give ahead of the challenge at usn.org/tigergiveback.